Dartmouth – From the harbour to its lakes, Dartmouth is a city shaped by water. 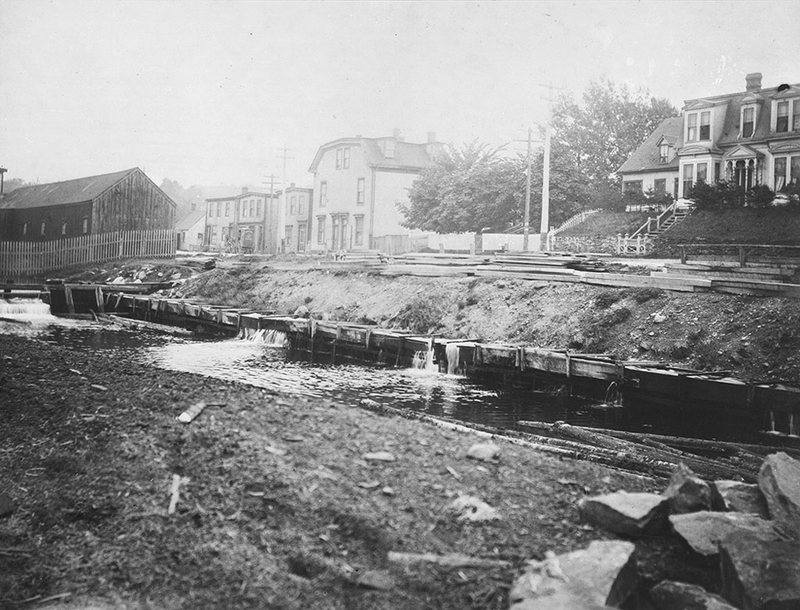 Flowing through Downtown, the half-kilometer long Sawmill River connects Sullivan’s Pond and the Shubenacadie Lakes to Halifax Harbour. Named for the sawmill that was built on its banks a year before Dartmouth was founded in 1749, the river has played a key role in the city’s history. It served as a Mi’kmaq canoe route, provided settlers with freshwater, was an important part of the Shubenacadie Canal and enabled industrial development, notably Starr Manufacturing. If you went looking for the Sawmill River today though, you would have hard time finding it. After Hurricane Beth caused major flooding in 1971, the Sawmill River was channelled into a steel pipe and buried underground. Now, 45 years later, the pipe that entombs the river is deteriorating and needs to be replaced. This presents Dartmouth with a rare opportunity to bring its lost river back to life. 1) Aquatic Habitat: Fish don’t like to swim up dark tunnels where the current never varies. They need light and pools to rest in. The underground Sawmill River is an impassable barrier that cuts Dartmouth’s lakes off from the sea. Changes in fisheries regulations since 1972 mean that Halifax is now required to install a fish passage. This could be done with a specially designed, and expensive, pipe that incorporates lighting and pools, or, with a daylighted waterway. Allowing trout, gaspereau and eels to swim upstream would be an environmental improvement and a plus for fishers. 2) Water Quality: Daylighted waterways are better at handling excess nutrients, a real concern in Dartmouth’s urban environment. If fish are able to spawn, mature and then swim out to sea, the net result would be the movement of nutrients, in fish form, out of the lakes. This could help control the weed problem plaguing Lake Banook’s aquatic clubs, a problem that Halifax is looking to spend $100,000s of dollars to try and manage. 3) Storm Water: The old thinking for dealing with storm water was to get it into pipes as quickly as possible. The downside of this approach is that pipes only have so much capacity and, if they get overwhelmed, they backup and cause flooding. This is particularly true in cities where hard surfaces, like pavement and buildings, speeds up the flow of water. The new thinking in managing storm water is to slow it down and let the land absorb it. Daylighting waterways is part of the new approach. In Kalamazoo, Michigan, daylighting Arcadia Creek significantly reduced the flood risk, saving Downtown property owners thousands of dollars in insurance and potential damages. In Dartmouth, the existing Sawmill River pipe lacks the capacity to handle a repeat of Hurricane Beth. Depending on the design, daylighting the river could help protect Dartmouth from flooding. 4) Economic/Social: Humans seem to be hard-wired to congregate near water. Daylighted waterways in other cities have become popular parks, greatly improving the quality of life and attracting tourists and new development. The economic return can potentially outweigh any additional cost. A daylighted Sawmill River would compliment the planned Canal Greenway Park, reveal part of Dartmoth’s history, draw visitors to Downtown and encourage redevelopment of nearby vacant and underutilized lands. It’s the kind of investment that supports the Regional Plan’s objective of focussing growth in already developed areas. With the Centre Plan set to revamp development controls in Dartmouth, the timing couldn’t be better. In deciding whether to daylight Darmouth’s river, it’s worth looking at another Saw Mill River, this one in Yonkers, New York. The Saw Mill River in Yonkers was buried in the 1920s after industrial activity and a rising population turned it into a polluted sewer. Nine decades later though, the city’s industrial base had collapsed and Downtown redevelopment was on the agenda. A portion of the river’s flow was diverted to the surface and the parking lot that had covered it in the centre of Yonkers was transformed into a park. The underground pipes were retained to handle excess storm water. The $19 million cost of daylighting was considerable, but developers proposed $3.1 billion in new housing, retail and office space along the waterway. Despite the recent recession, many of the projects are underway, meaning that daylighting’s one-time cost will be more than paid for by increased tax revenue. The project has been so successful that Yonkers is now daylighting other sections of the Saw Mill River. Yonkers demonstrates that daylighting can be good for the environment, community, economy and even the municipal budget. What Would a Daylighted River Look Like in Dartmouth? In Dartmouth, daylighting the entire Sawmill River, from Sullivan’s Pond to the Harbour, would be complicated because of the major intersection at Portland Street and Alderney Drive, the Lock 4@Starr development and the Esso station. 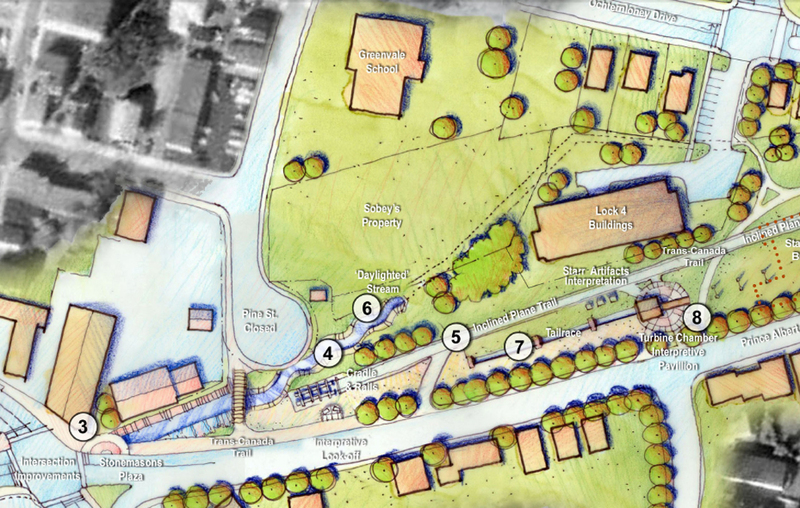 A Dartmouth planning firm, Ekistics, prepared a conceptual plan for the entire Canal Greenway Park in 2002, which was then updated to reflect new developments in 2006. The 2006 plan shows a daylighted Sawmill River at the lower end of the Greenway. Ekistics indicates that the width and depth of this daylighted portion would allow for the complete removal of the pipe with no loss of storm water capacity. The 2006 Ekistics plan proposes daylighting the easily doable lower portion of the Sawmill River. That would be a great start, but the question remains, could Halifax go further? This opportunity to daylight the river when the pipe needs to be replaced only comes around once every couple of decades. One alternative would be to daylight the pipe on the privately-owned lands. 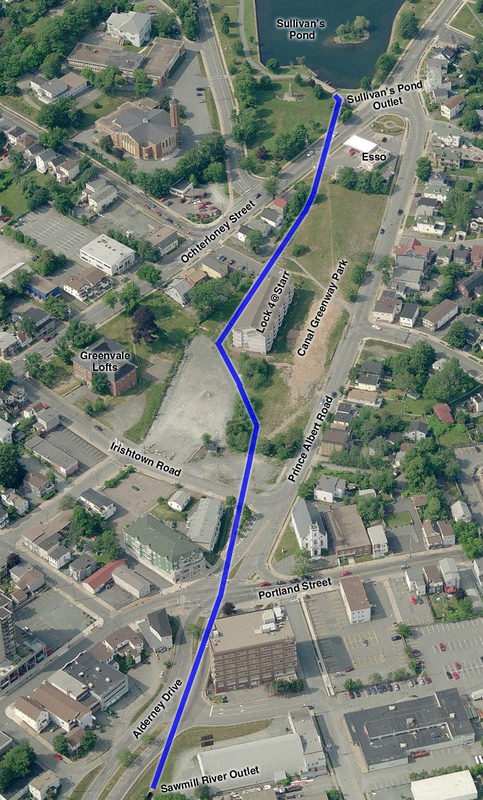 This has the advantage of following the existing route, but the disadvantages are the Lock 4@Starr parking lot would need to be reconfigured, the river would need retaining walls and Halifax would have to negotiate with the property owners with no guarantee of success. Another option would be to bring the river through the municipally owned Greenway between the old marine railway/trail and Lock 4. This was the original 2002 Ekistics plan. Unfortunately, Rob LeBlanc at Ekistics indicates that the 2005 development of Lock 4 means that there isn’t enough room left to build a riverbed on the Greenway that could handle potential storm flows. Fortunately, there is another solution that might work. To daylight more of the Sawmill River, we should borrow from Yonkers and split the river’s flow in the upper portion of the Greenway. In this scenario, the existing pipe would be left in place in front of Lock 4@Starr while a daylighted stream would run behind the building in the Greenway. Since the Lock 4 section of pipe would remain, the Greenway stream wouldn’t have to be built to handle peak storm flows. Instead, it could be designed for regular water levels, shrinking the amount of space needed and making a route through the upper Greenway possible. The two branches of the Sawmill River, the underground pipe and the stream, would reconnect below Lock 4 on the lower Greenway where the 2006 Ekistics plan indicates that there is enough space for a completely daylighted river. The extra cost of retaining the pipe in front of Lock 4 would be minimal because that section of pipe just happens to be the one and only piece that is in good condition. It was replaced as part of the Lock 4 development in 2005 and should last for several decades. Retaining the pipe and adding a daylighted stream would increase the storm water capacity, meaning this approach could even save money if it avoids the need to replace the relatively new Lock 4 pipe with a larger one. Daylighting the Sawmill River through the Greenway also keeps the possibility open of one day uncovering the last section of river around Ochterloney Street. As part of a 2002 development agreement, Halifax is guaranteed an opportunity to purchase the Esso gas station at Ochterloney and Prince Albert Road if it is ever put up for sale. If Halifax buys the gas station one day, the old stone bridge buried under Ochterloney’s pavement could be unearthed and the Greenway stream could be brought right into Sullivan’s Pond. It would be a beautiful sight! 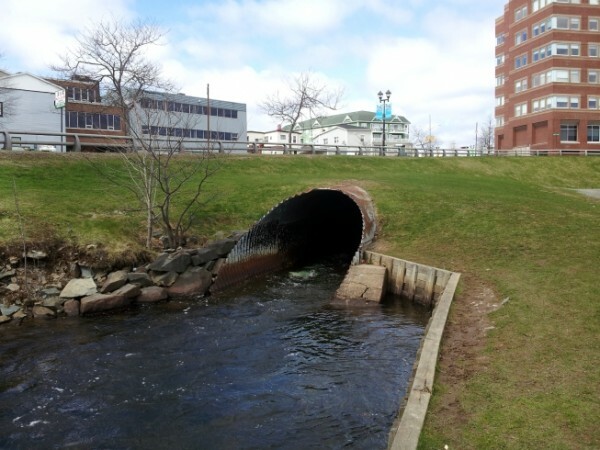 A daylighted Sawmill River in a new park in Downtown Dartmouth would be wonderful, but can we afford it? It all depends on your perspective. The first question in assessing cost is how much more would daylighting be compared to just replacing the pipe? Many millions have to be spent regardless of whether daylighting proceeds. Replacing the pipe might be cheaper, but it provides a lot less other benefits. A daylighted waterway combined with a developed Canal Greenway Park could also bring new investment to Downtown Dartmouth, possibly making up for any additional expense. There isn’t much development potential on the Prince Albert side of the Greenway, but there are opportunities along Ochterloney. There are 7 old houses on Ochterloney around Maple Street that back onto the Greenway and all of them are actually being used for commercial space. 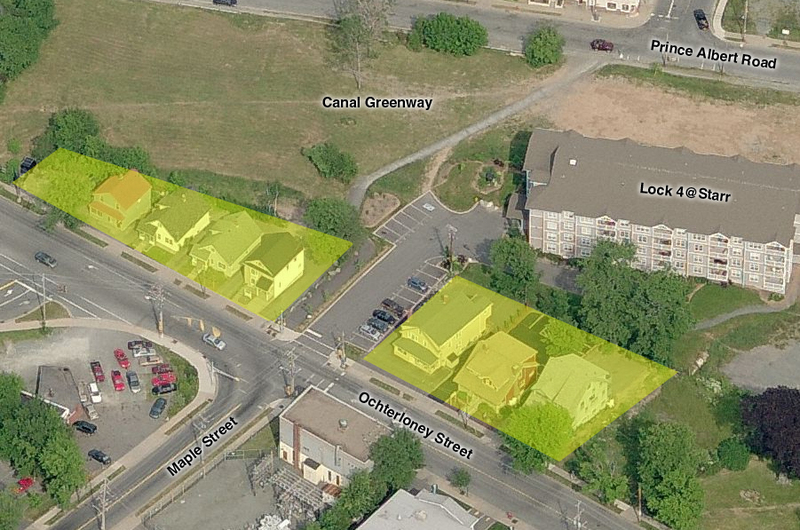 A developer could consolidate these lots and construct two mid-rise buildings, which, if well designed, should have no negative impact on the Greenway, Sullivan’s Pond or the surrounding neighbourhoods. The 36 condos in Lock 4@Starr are collectively assessed at $7,790,000, which translates into an annual tax bill of $100,000. Assuming the Ochterloney properties could bring in a similar amount, the annual tax benefit to Halifax would be about $200,000. Over the infrastructure’s 40 year time horizon, that would be, in current dollars, an additional $8,000,000 in tax revenue. The positive financial impact of developing the Greenway and daylighting the Sawmill River would likely extend farther than the immediate properties into the Downtown business district and Dartmouth Cove. The river and park could be an economic driver and any analysis that focuses solely on costs should also consider the broader financial benefits. It would of course be possible to develop the Greenway with the existing tax base, but there are many competing demands on Halifax’s budget. Attracting and tailoring the right kind of new development would lessen the financial burden and also work towards the municipality’s goal of bringing more growth to the urban core and increasing Downtown Dartmouth’s residential population. Daylighting might appear to be expensive, but it provides better value and might even be the cheaper option in a full-cost accounting model. It shouldn’t be casually dismissed. The Ecology Action Centre will be presenting the case for daylighting Sawmill River to Harbour East Community Council on November 13. They’re asking anyone who supports daylighting to write their councillor. A terrific idea , great article, minor correction Hurricane Beth was in 1971. Thanks Cathy and yes you’re correct. 1971. I’ll make the correction. In cities like San Antonio, TX, the “Riverwalk” is a hugely popular social hotspot for businesses and tourists. 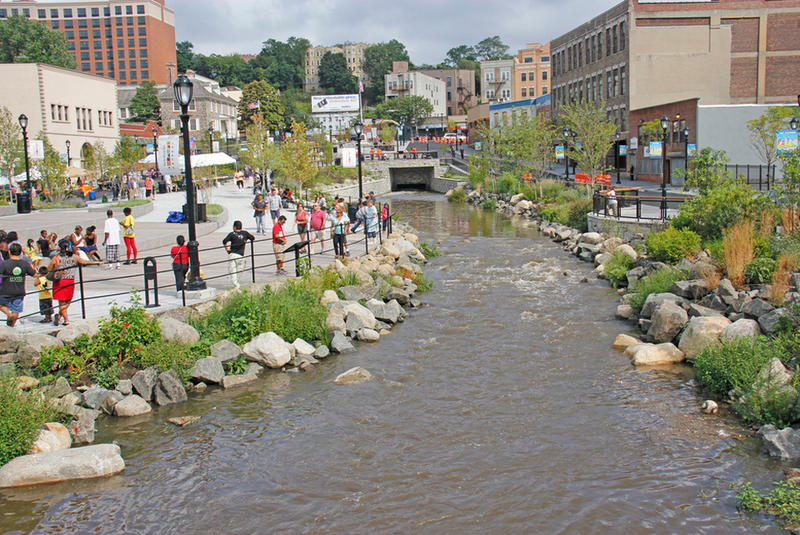 Like the Cheonggyecheon in Seoul, and Saw Mill River in Downtown Yonkers, NY, businesses flourish creating a genuine pedestrian area that isn’t invaded by the sounds of busses and cars. If anything i think the daylighting should expose as much of the river as possible alongside the monument in the southern part of sulivans pond park.